According to the ticking clock on the "China Population" web site, the estimated population of China was 1,324,312,271 in March 2008. However, this number is definitely under-estimated because I find the clock only ticks once after the "birth-in-2007 clock" below it ticks twice. According to Wikipedia, there were 1,242,612,226 people in China by the 2000 census, and the 2007 estimate is 1,321,851,888. The figures below are the 2001 estimates for the ten largest urban populations of China within administrative city limits; a different ranking exists when considering the total municipal populations (which includes suburban and rural populations). The large floating populations of migrant workers make conducting censuses in urban areas difficult. The figures below do not include the floating population, only long-term residents. Source: Wikipedia. Click here to see the population of more cities of China. 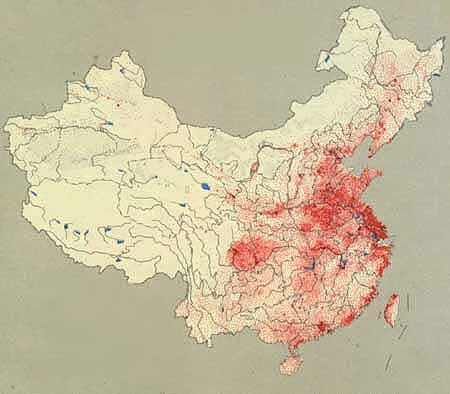 The following is a population density map of China in 1990. Each red dot represents 50,000 people. China's population control policy, the "one-child policy", was introduced in 1979 by the Chinese Communist government. Its original name in Chinese is called Planned Birth policy. The reason claimed by the Communist regime to introduce the policy is to alleviate overpopulation and environmental problems. Actually this "Planned Birth Policy" is totally wrong, evil and absurd. However, In current China, it is a society governed by a Communist regime, there is no freedom of press and there is no freedom of expression. People have no access to the complete information about consequences of population policy and have no way to challenge a wrong policy. This is the reason why this policy has got admitted by Chinese people. According to this policy, if I am a member of a family having two children, I will be denied of access to free entry to primary school, and I'll be denied of health care and many other benefits. I will get no bonus at workplace. This is total discrimination. The core spirit of the one-child policy is discrimination, which is against both Chinese constitution and basic principles of international law. The one-child policy is a total trampling of "Universal Declaration of Human Rights". According to the Chinese Communist regime's official claim, their Planned Birth Policy is applied differently to different ethnic groups and regions. To people of Han Tribe, which is the majority tribe of Chinese nation, who live in urban areas, this polity is applied strictly. At the same time, minority ethnic groups can have more children. In rural areas, families are allowed to have two children if the first child is female or disabled. So the policy in practice seems funnier. It means if am a member of Han ethnicity then I have less rights in bearing children than those of other ethnicities. This is totally absurd and is a trampling of the principles of "Universal Declaration of Human Rights". No one shall be discriminated for one's gender, ethnicity, color, race, religion and so on. In Bobai County, Guangxi Province, Government hangs banner saying "To those who do not apply intrauterine device or tubal ligation or refuse to pay fine for extra birth, smash, smash, smash!" The officially claimed methods to implement the one-child policy include denying the family's health care, bonus at workplace and children's free education etc. This is horrible in practice! It means if I am a boss of a company or a director of a workplace, I have to involve myself into implementing this discriminative policy. I cannot issue bonus to my employees according to their performance in work but according to how many children they have! If I do not enforce this policy within the workplace that I am in charge of, I will be removed by the government. Additionally, in practice the real methods used by the regime to implement the one-child policy are far more brutal than the above. The staff of the "Planned Birth Committee" (PBC) of local village or community can kidnap women who are expecting the second child and send them to hospital to do forced-abortion. If the woman has escaped, the local police will arrest and detain the woman's husband or even the elderly parents. This kind of detention is totally illegal. Some local governments impose very high fines on families who have more children and take this policy as a way to bring income to the local government. If people do not pay the fines for having more children, the PBC staff will mobilize a gang to ransack that family. In May 2007, this kind of violent practice by the government triggered big riot in Bobai County, Guangxi Province, where furious people set town government buildings to fire. Click here for detailed report. In May 2007 Bobai County, Guangxi province of China, governmental staff's ransacking homes of people who refuse to pay fines for extra birth triggered big riot that furious people set town government building to fire. During the implementation of one-child policy, a lot of forced-abortions have happened. The right of being given to birth is more basic than any other human rights. No one has the right to deprive other people's rights of being given to birth. Forced abortion is just killing a life. And it is more evil than killing an adult because it deprives the whole lifetime of a person. However, due to the Chinese Communist regime's destroying traditional culture and moral values, majority Chinese people do not realize this any more. The one-child policy does not solve any problem but creates problems. Now a growing problem in China is the crisis of aging population. The Chinese people aged over 65 will increase from 7% of the total population of China in 2000 to about 20% in 2040. Matching this, there will be a decrease in the ratio of working age people to support each elderly person from 5 to 1 to 3 to 1. Actually this problem has been obviously there from the very beginning. Under such policy, one's grandparents, two couples, will finally become two people, who are one's parents, while the two people will become one single person of oneself. In a long run, the Chinese people will become extinguished following a 4->2->1 style. The one-child policy is actually a gradual genocide policy against the Chinese nation. In traditional Chinese society, there was no social pension or welfare system to support elderly people. Sons carry the responsibility of supporting parents when they become elderly. Females after getting married played a supportive role in their husbands' family and do not shoulder the responsibly of supporting her own parents. This is a feature of social structure, but does not mean discrimination against female originally. The Communist regime's discriminative rural policy makes rural people the second class citizens who have no pension, health care etc. They can only depend on their sons when they get elderly. Son is their pension and is their elderly support. So if a rural Chinese citizen has no son, it means he has no guarantee of future life. Additionally the Communist party's systematic damaging of traditional morality had made Chinese people's morality deteriorate very fast. Many modern Chinese people do not know that forced-abortion is equal to killing. Therefore, the discrimination against female children is not an attribute of Chinese culture but an abnormal social phenomenon caused by the Communist regime. There are too many huamn rights problems caused by the One Child Policy in China. This is actually an anti-humanity policy and has manifested the nature of the Communist regime. The illusion of China's economic booming has made a lot of western people forget and ignore the nature of the Chinese Communist regime. This government has not really changed. Its nature is still the same as Mao's time and Stalin's time. The human rights and social freedom of Chinese people have not developed together with the economy at all. If you are going to China for business or you are interested in China, the "Nine Commentaries on Communist Party" is a must read for you to know about the country. This book is bringing about huge change to China from inside. Up to March 2008 there have been over 33 million Chinese people quitting the Chinese Communist Party and its affiliated organizations. This tide is exactly the same as what had happened in former Soviet Union before it collapsed. Go to top of page "Population of China"
Return from "Current population of China" to "Foreigners in China"